After what seems like a month of nonstop travel, life is finally slowing down in our household this week. We’ll be spending the next few weeks at home and I’m so excited to get back into my routine of cooking. When life gets hectic, I often find myself craving time in the kitchen. It’s the place where I can escape from other aspects of life and lose myself in a good recipe. That’s exactly what I did when we arrived home from a weekend away this week. James had been sick all weekend and requesting nothing but soup to help nurse his aching throat back to health. It gave me the perfect excuse to make a batch of my Grandpa Cattaneo’s tortellini, which may be the most treasured recipe among my mother’s side of the family. The recipe itself is delicious – it’s one that my cousins, aunt and uncle always request when they’re visiting. But it’s the tradition of making the tortellini that makes us love it so much. This is a recipe that’s rarely made alone, but rather assembled with family around the table, helping to crank out dozens of delicious pasta pillows. I have fond memories of making this tortellini with so many people I love — and I considered it a true test of our relationship the first time I asked James to lend a hand. It’s now a tradition he also embraces. My family typically makes several batches of tortellini between Thanksgiving and Christmas to gift to others or enjoy as part of our holiday celebrations. 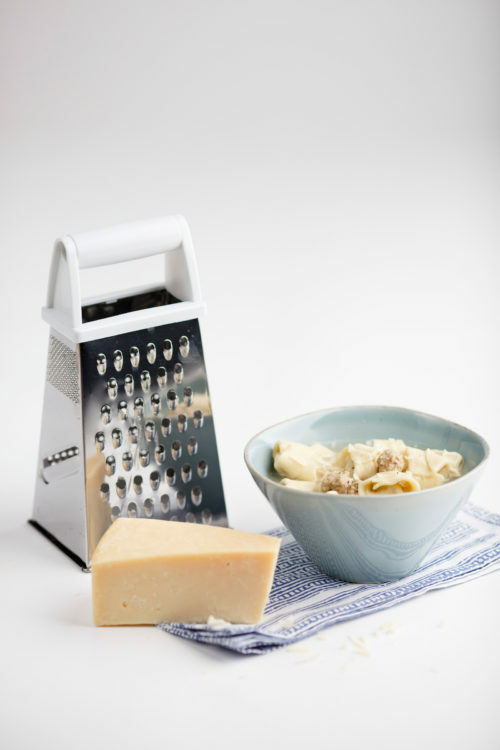 But, I look for any excuse to dust off my pasta machine and make this ultimate comfort food. When done alone, the task is time consuming. The delicious results make it worth the effort. Everyone in my family has the same hand-crank pasta machine, which I can’t recommend enough: the Marcato Atlas. This recipe is written according to the settings on that specific machine, but can be adjusted if using different equipment. I suggest serving this tortellini in the traditional Italian way — with simple toppings that let the fresh pasta shine. 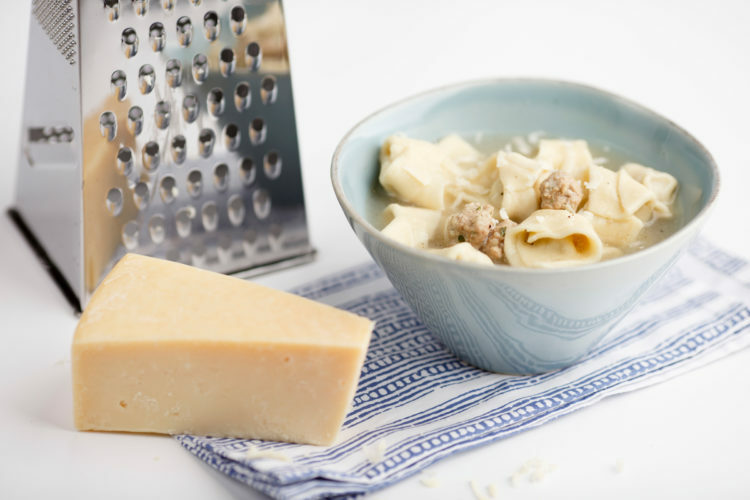 We eat it most often as a soup, boiled in homemade chicken stock and topped with parmesan. It’s also lovely with fresh marinara sauce. Place flour on a large, clean surface. Form it into a small mound, then make a large hole in the middle of the flour. Carefully pour egg and egg yolks into the depression in the center and use a fork to lightly beat eggs. Once eggs are combined, add water to the eggs and use a fork to slowly incorporate the flour with the liquids. If the dough appears too dry, add an additional 1/2 tsp. of water until it starts to come together. Once the flour is incorporated, the dough will likely look shaggy and bumpy. Use your hands to carefully fold the dough a few times, being sure to pick up any loose pieces. Once the dough is staying together, slowly start kneading it. If the dough starts sticking to the counter or your hands, sprinkle it with more flour. Continue kneading the dough until it’s smooth and pliable — this will take several minutes. Form the dough into a ball then cut it in half. Wrap each half in plastic wrap and refrigerate for at least 30 minutes. While dough chills, make the tortellini filling. Combine egg yolk, garlic, onion, parsley, Italian seasoning, bread crumbs, parmesan, salt and pepper in a large bowl. Whisk until combined. Add ground turkey and use your hands to mix with seasonings until just combined. Chill until you’re ready to assemble the tortellini. Once you’re ready to make your tortellini, remove one of the dough balls from the refrigerator. Place the dough on a lightly-floured surface and use a rolling pin to roll it out into a disk that’s about 1/4-inch thick. Carefully run the dough through the widest setting on your pasta maker (on my machine this is the 0 setting). Fold the pasta sheet into thirds, then run it through the machine again on the same setting. Repeat this process of folding and feeding the dough through the machine on the same setting once more. At this point you should have a smooth but thick pasta sheet. Change the machine’s setting to the next widest thickness (on the Atlas that’s 1). Run the pasta sheet through the machine, then change the setting to the next level and run the pasta sheet through the machine again. Repeat this process until you achieve a thin, long sheet of pasta — I go until level 6 on my machine. Carefully place the sheet of pasta on a clean surface and cut it in half vertically so you have two, long, wide sheets of pasta. Use a ruler to trim the edges of the pasta sheets to form rectangles, setting any dough scraps aside. Next, use the ruler to cut each pasta sheet into several two-inch squares, again setting any dough scraps aside. To fill the tortellini, take 1/4 tsp. of turkey mixture and form it into a loose ball. Place filling in the center of each square. To shape the pasta, fold one corner of the square to meet the other (forming a triangle), then press down on the edges to seal the pasta. Then press the two opposite edges of the triangle together to form the tortellini. Dip your fingers in a small bowl of water before shaping each piece of tortellini if the pasta isn’t sticking together easily. Repeat the process until you’ve formed all squares into tortellini shapes. Place the tortellini on a parchment paper-lined baking sheet and freeze for ten minutes, until firm. Transfer frozen pasta to a large ziplock bag and freeze until ready to use. Take any scraps of dough and use your hands to form them into a small disk. Run the disk through the pasta machine starting on the widest setting and repeating until you’ve reached the desired thickness. Trim the edges of the pasta sheet using a ruler to form a rectangle, then use the ruler to cut as many 2-inch squares out of the dough as you can. Fill and fold the tortellini as outlined in step 7. Repeat this process until you’ve gotten as many 2-inch squares out of the dough as possible, then freeze the tortellini as outlined in step 8. Repeat steps 4 through 9 with the second half of the pasta dough. Roll any leftover turkey filling into teaspoon-size balls and place on a parchment-paper lined cookie sheet. Freeze meatballs for 15 to 20 minutes or until firm before placing in a ziplock back and storing in the freezer until ready to use. 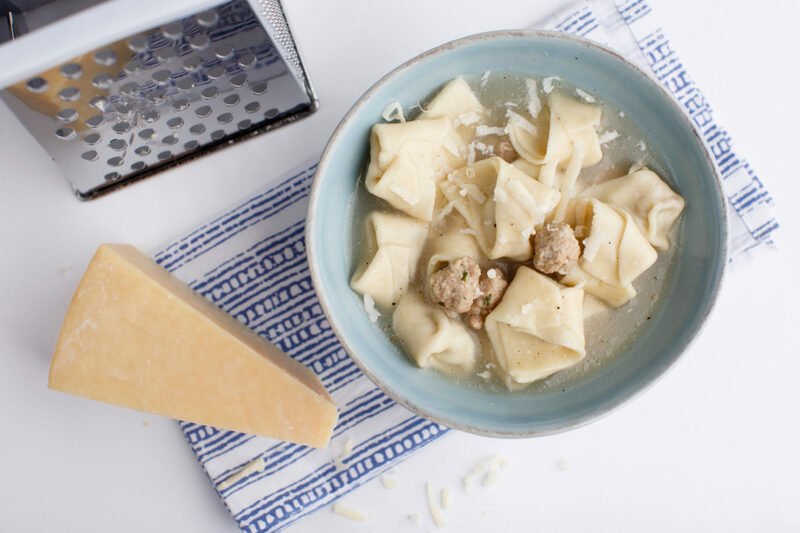 To prepare tortellini, take it and the meatballs out of the freezer and carefully pour them into a large pot of boiling water or chicken broth. The tortellini and meatballs are ready when they float to the top of the water or broth, about 3 to 4 minutes.